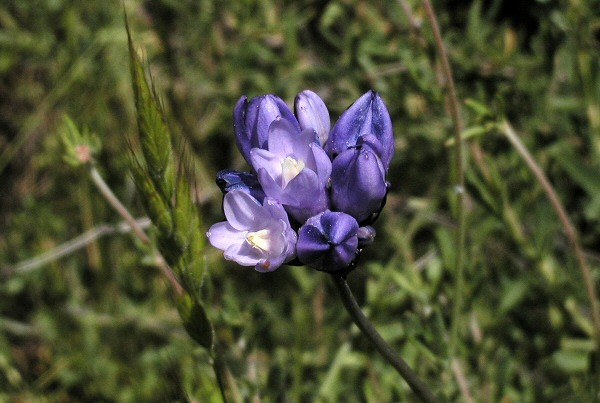 Dichelostemma capitatum is commonly known as Blue Dicks. 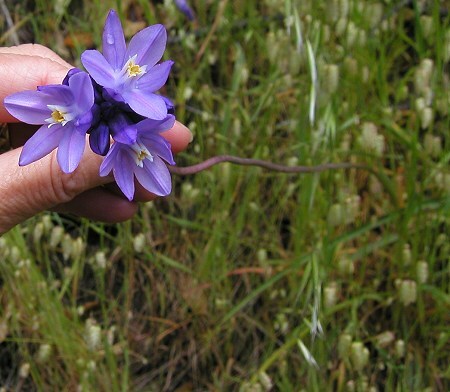 This plant is widespread in California, spilling into Oregon and Baja California from the coast to the foothills and even to the deserts. 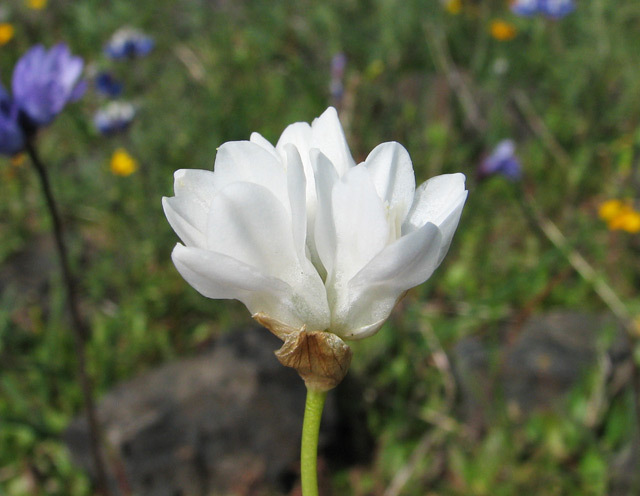 This species is part of the diverse flora growing on Table Rocks in Jackson County, Oregon. 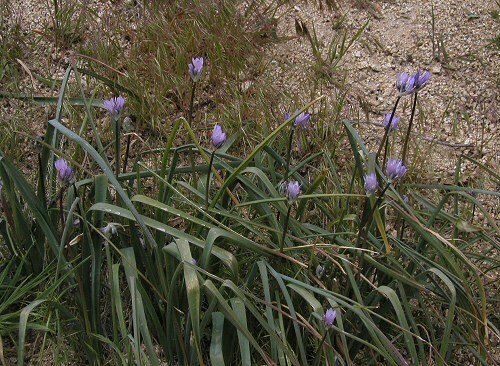 The flower stems appear from March to May, carrying umbrella-like flower clusters. 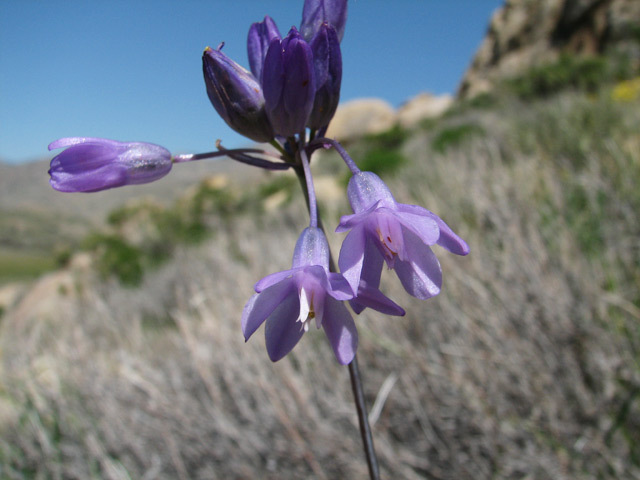 The bell shaped flowers are usually lavender to violet, occasionally white or purplish pink, and unlike the other species in this genus have 6 stamens. 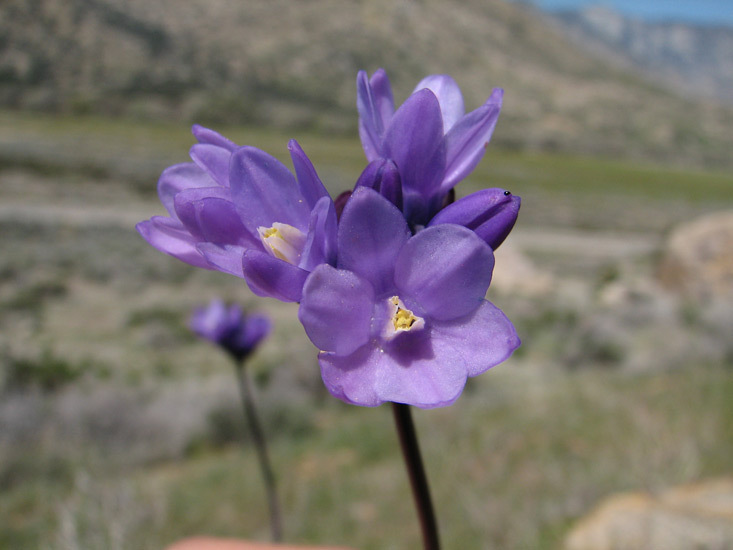 The flower tube is not narrowed below the lobes as it is in the other two species that are much the same color and the filament crown is forked. 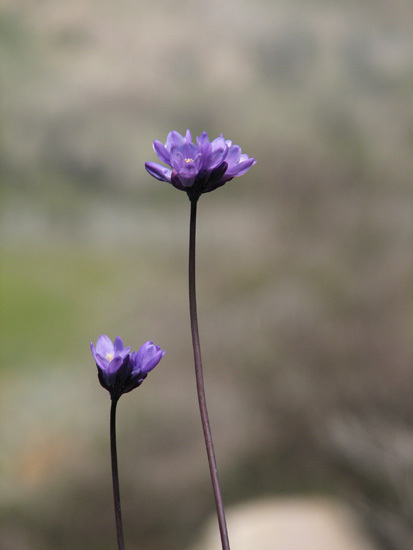 It also varies greatly in how tall it is depending a lot of the habitat where it is found. 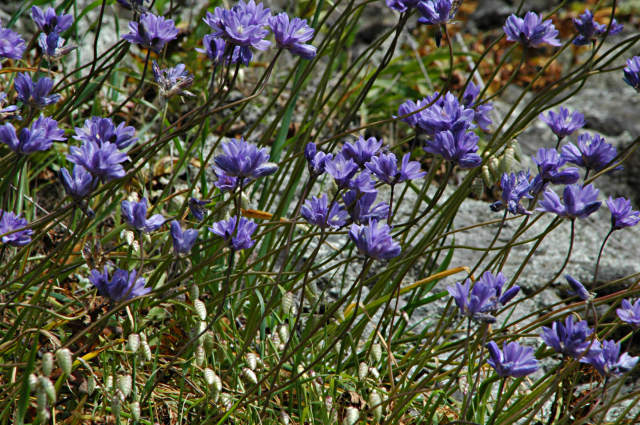 Corms are reported to be edible and collected by Native Americans who lived in their native range. 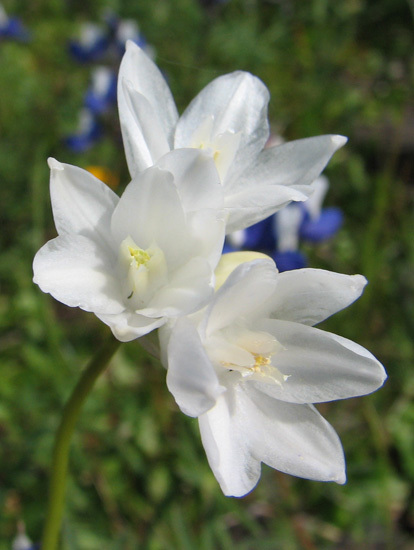 Research shows that removal of adult corms actually facilitates an increase in number of plants due to the many cormlets left in the ground as a result of the removal process. 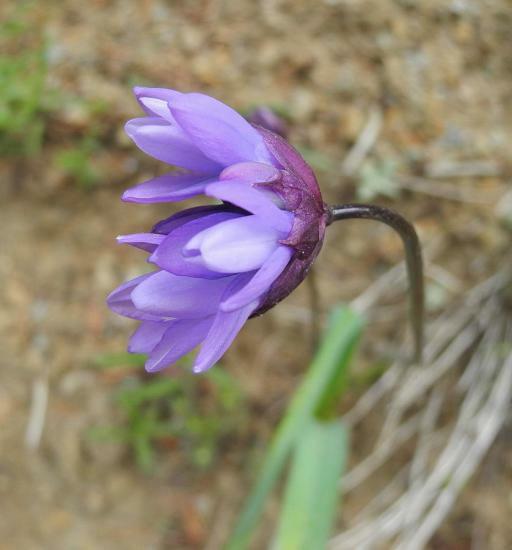 This species prefers to be grown in a deep container such as a 1 gallon pot where it can send its deep roots. It also likes to be fertilized during growth. 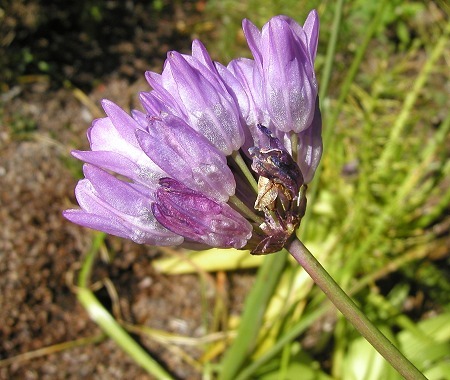 It is susceptible to snails and slugs so protect the plant! 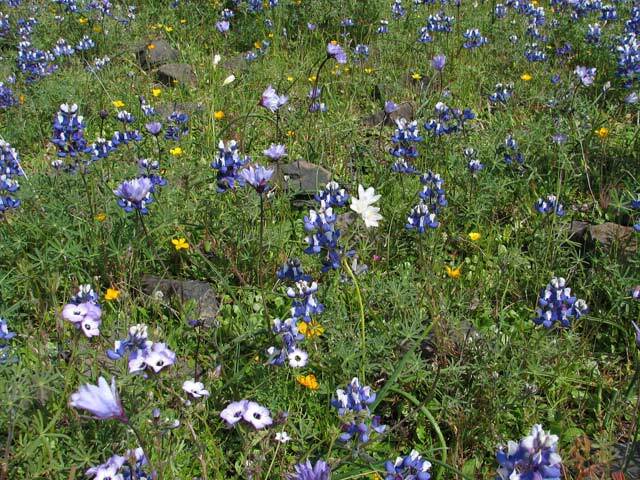 Photos 1-3 by Bob Rutemoeller show the flowers in the middle of a Lupine and then alone where the leaves are shown as well. Another view shows the tube. 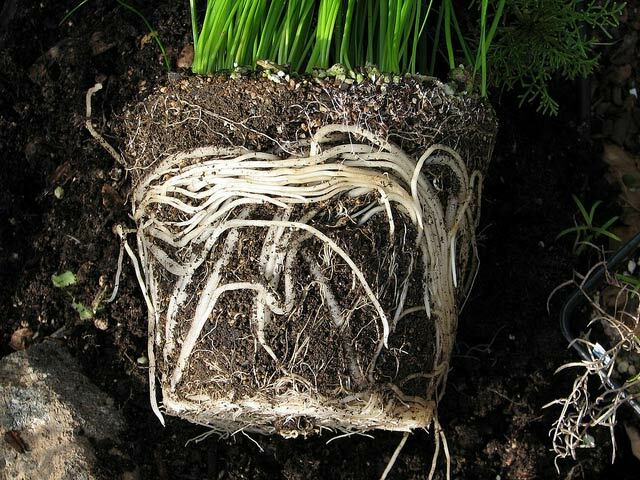 Photos 4-5 by Nhu Nguyen shows the vigorous root system of the plants. 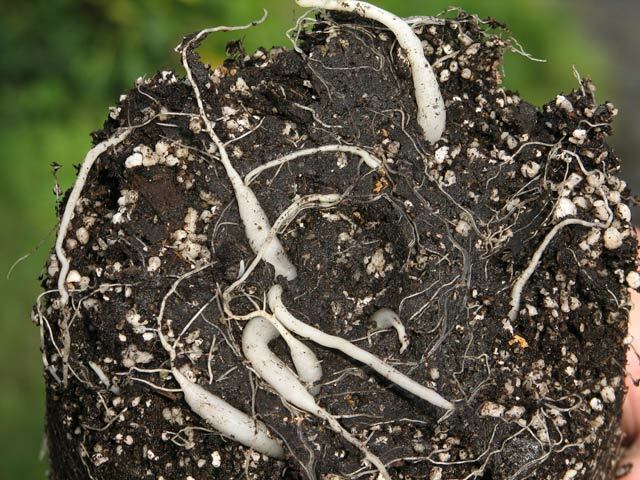 The thickened part of the root in photo 5 will eventually be consumed by the developing corm. 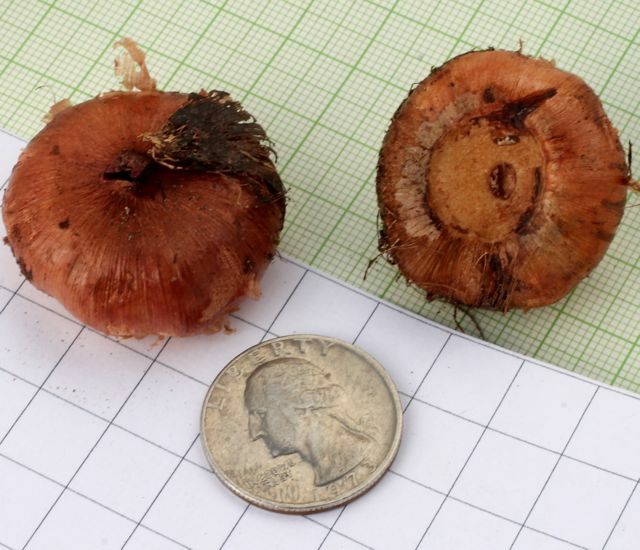 Photo 6 by M. Gastil-Buhl shows corms grown by Jim Duggan on a 1 cm grid. 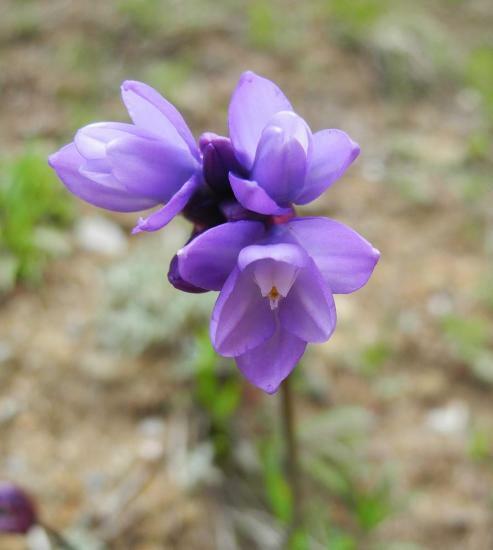 In April of 2015, Travis Owen came across a large colony of Dichelostemma capitatum at the side of the road in Rogue River, Oregon. 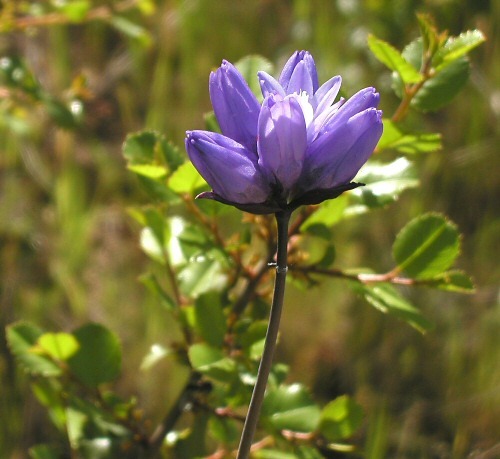 Photos below were of the colony, on a steep bank with Ceanothus, Toxicodendron, and Arbutus trees surrounding the patch. 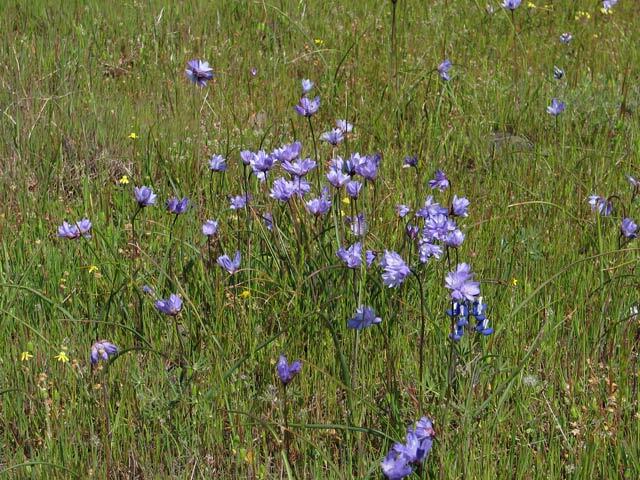 Humboldt County photos taken by Mary Sue Ittner near Horse Mountain. 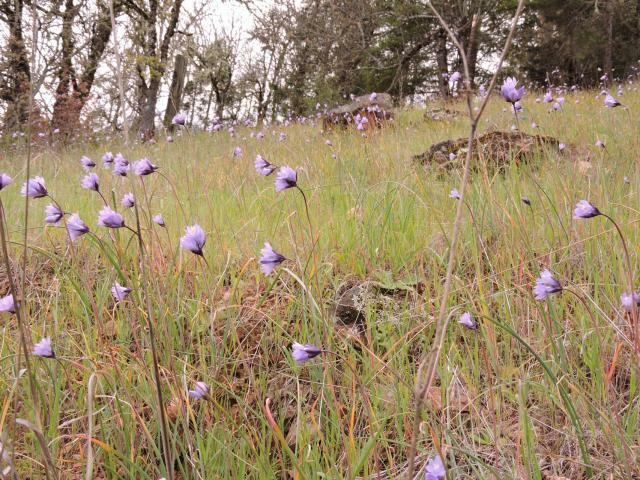 Butte County - the photos below were taken by Nhu Nguyen. 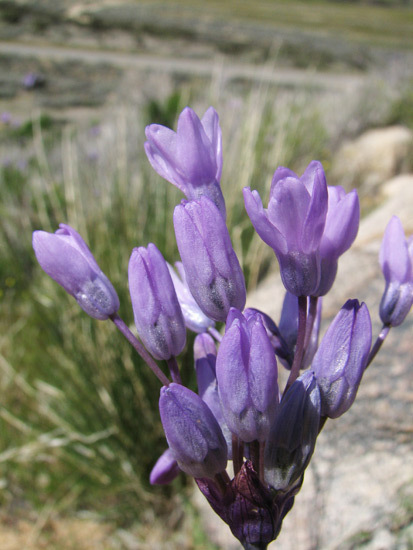 Photo 1 shows a lavender form. Photos 2-5 shows a rare white form. 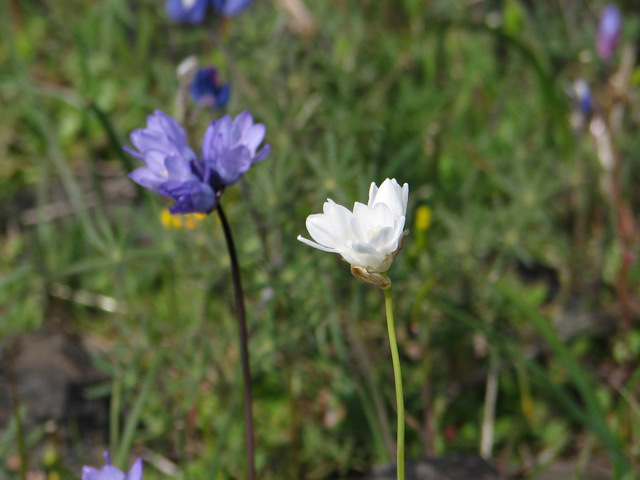 Photo 3 shows the white form growing next to a purple form. 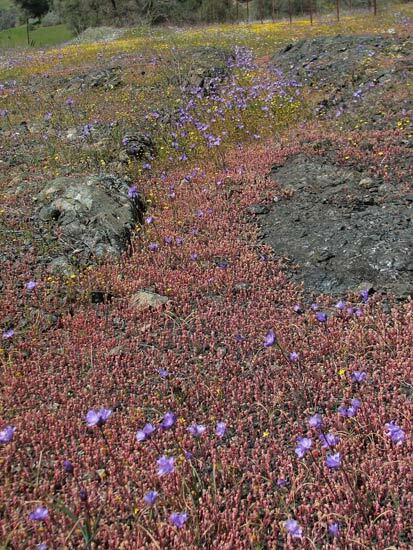 Lake County - the photo below was taken by Mary Sue Ittner of a dwarf form growing in a wet serpentine area with Mimulus guttatus. 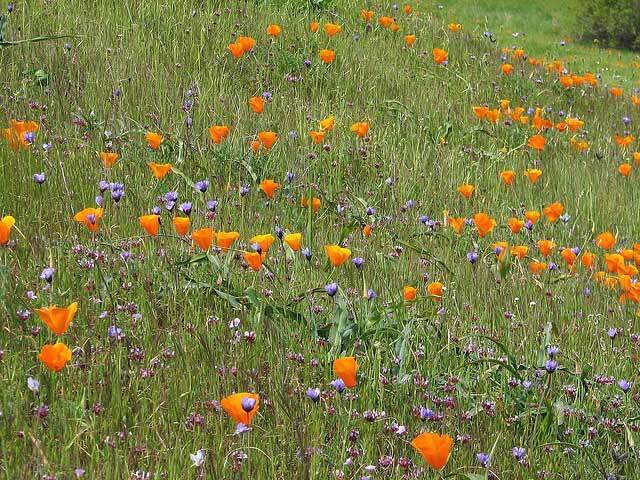 Sonoma County - the photos below were taken by Bob Rutemoeller and Mary Sue Ittner. 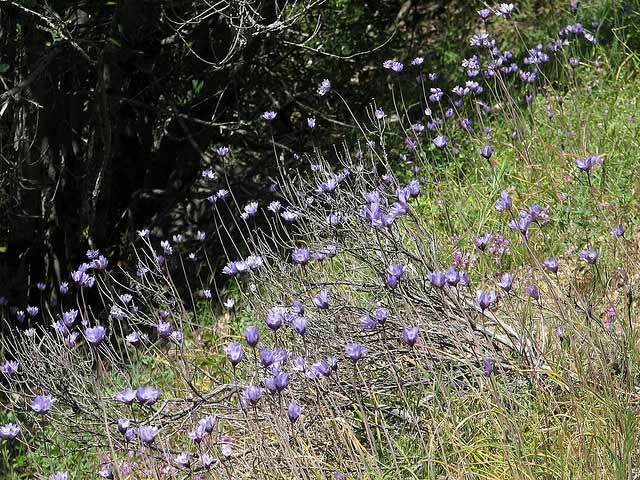 Photo 1 shows a population growing on a rock overlooking Highway 1, safe from predators no doubt. 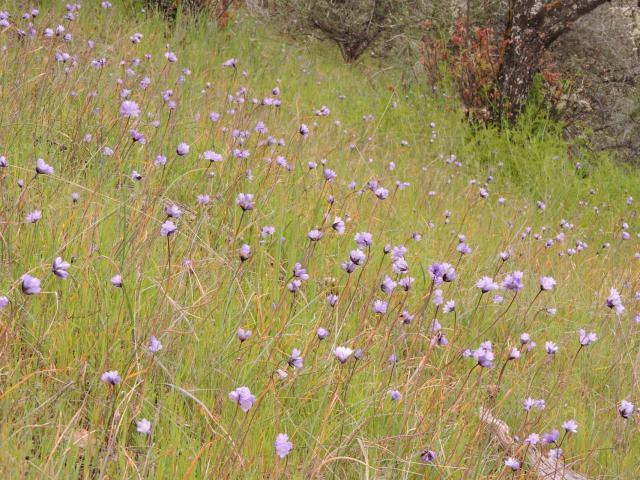 Photo 2 shows the plants growing in a grassy area near another local road. 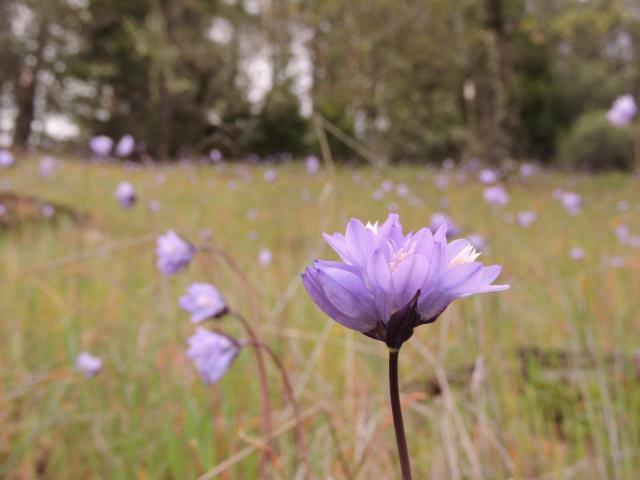 Napa County - the photo below as taken by Nhu Nguyen at the Stebbins Cold Canyon Reserve. 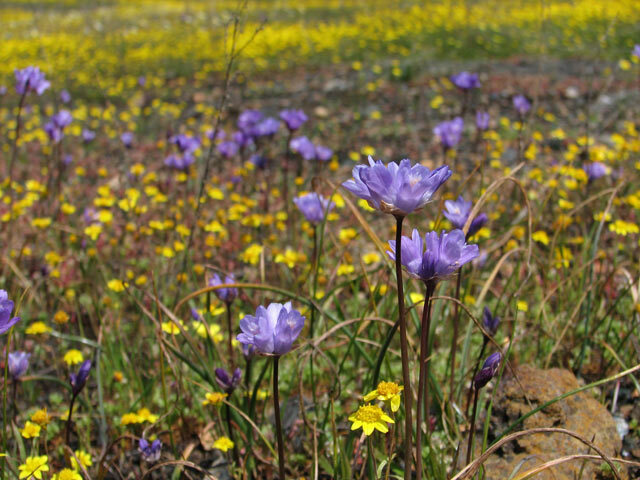 Contra Costa County - the photos below was taken by Nhu Nguyen from Mount Diablo State Park. 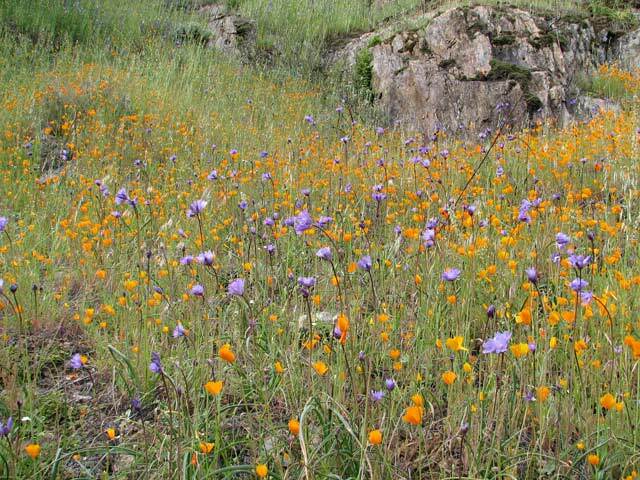 Photo 2 shows a classic purple and orange contrast between D. capitatum and Eschscholzia californica. 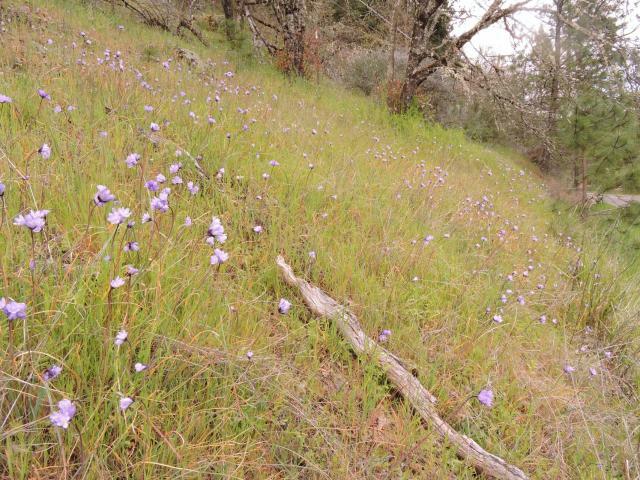 Mariposa County - the photos below were taken by Nhu Nguyen. 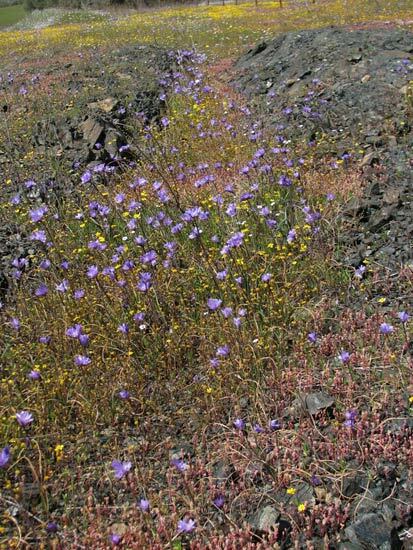 Photos 1-3 were taken on a roadside rock outcrop of CA HW140. 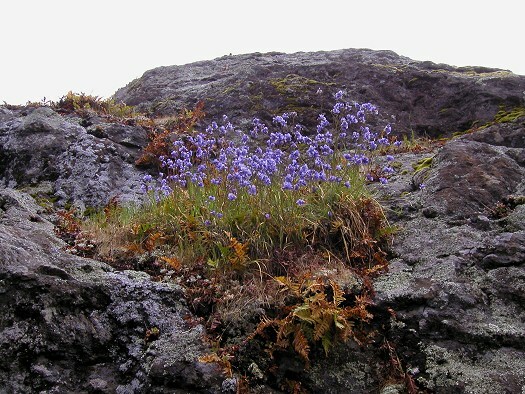 Photo 3 shows the bulbs growing with a beautiful Parvisedum species on the rock outcrop. Photos 4-5 was taken on the trail at Hite Cove Trail. 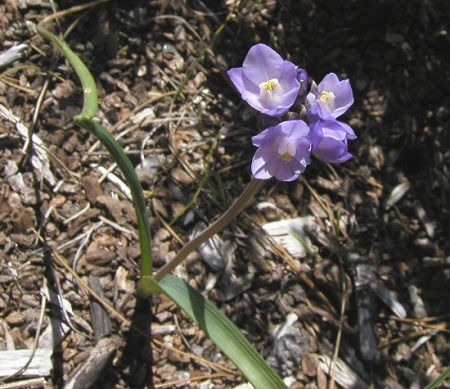 Here the bulbs are contrasted against the orange of Eschscholzia caespitosa. 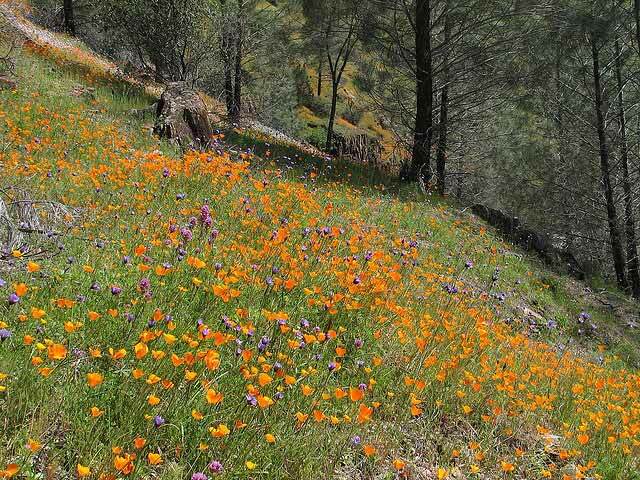 San Benito County - the photo below was taken by Mary Sue Ittner at Pinnacles National Park. 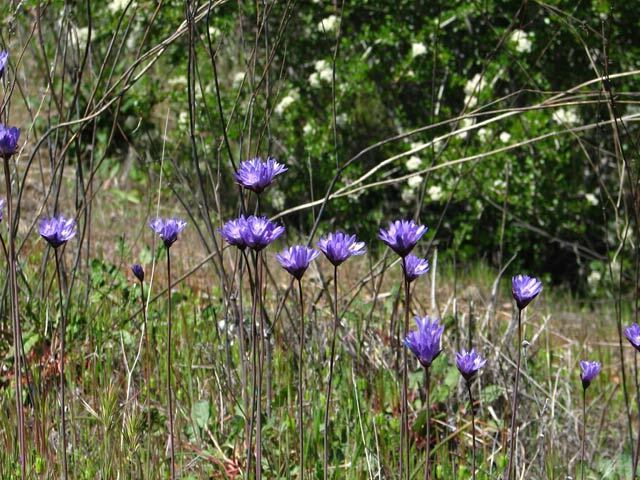 San Luis Obispo County - the photo below was taken by Mary Sue Ittner. 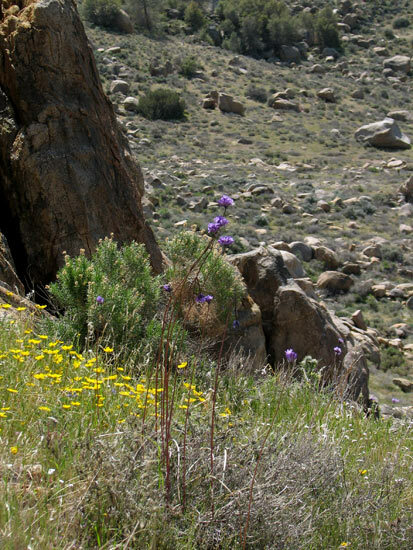 Kern County - photos 1-5 were taken by Nhu Nguyen at a rock outcrop outside of the town of Onyx on the western edge of the Mojave Desert. 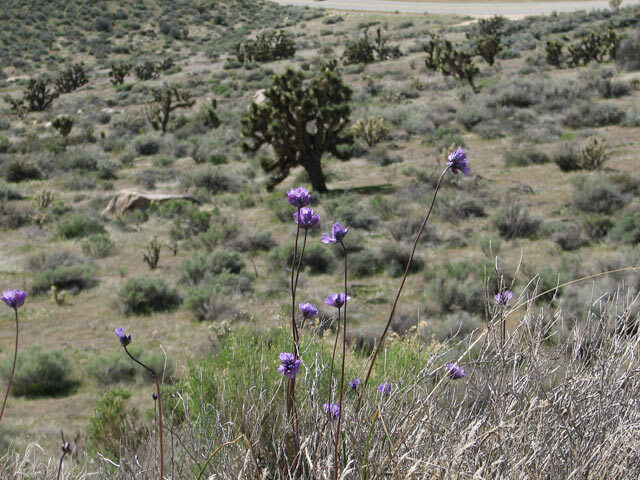 In photo 2, the background tree is a Joshua Tree (Yucca brevifolia), a landmark plant of the Mojave Desert. Photo 6 was taken by Mary Sue Ittner. These photos were taken by Nhu Nguyen at a rock outcrop outside of the town of Onyx on the western edge of the Mojave Desert. 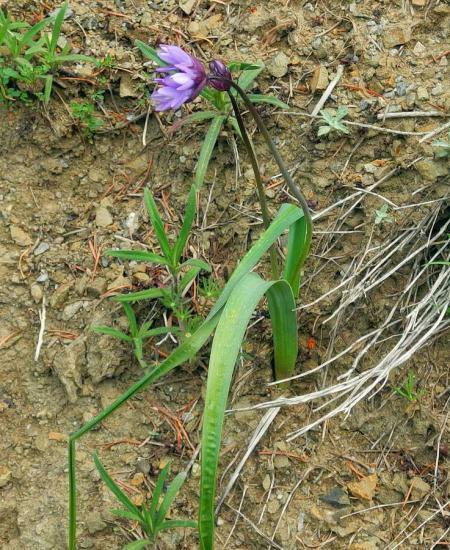 A few of the plants have interesting and long pedicels. 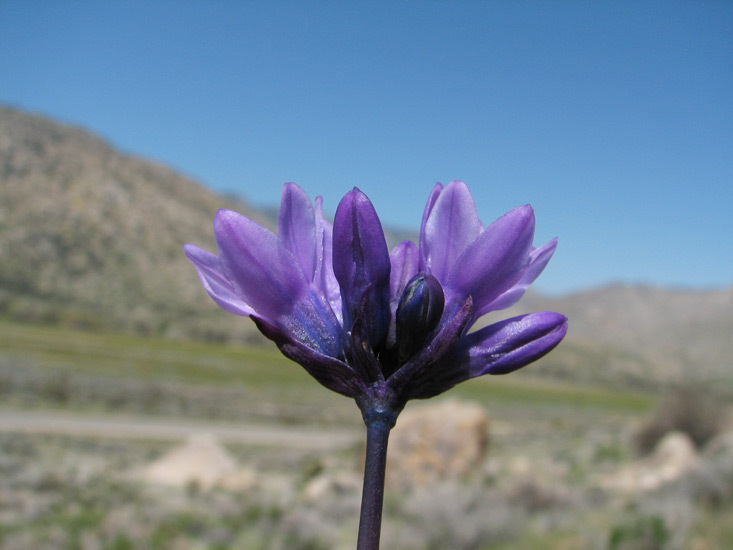 Los Angeles County - the photo below was taken by Lee Poulsen in the Antelope Valley California Poppy Reserve on the western edge of the Mojave Desert outside of Lancaster, CA on April 2, 2005. 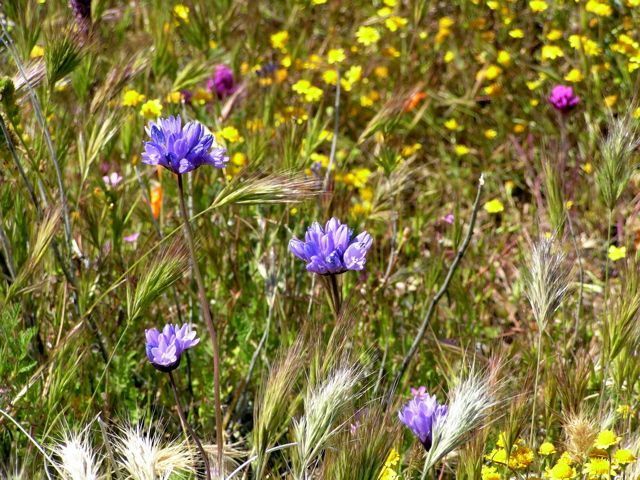 San Diego County - the photo below was taken by Jim Duggan. Return to PBS wiki Photographs and Information page.